Beginner's Guide To A Head-On Collision. Sebastian Matthews. Red Hen Press. Pasadena, California. 2017. Sebastian Matthews Beginner's Guide To A Head-On Collision reads like a pot-boiler. The anguished scream of metal on metal is one of the first things we hear as Matthews takes us inside a head-on collision with a dead man. Matthews car was struck by the victim of a fatal heart attack. A dead man was driving the car that almost killed Matthews and family. These poems explore in minute detail the seconds surrounding the accident as they telescope back and forth across his consciousness and morphine haze. Time takes on entirely new properties from the time it takes two cars to collide to the time it takes for two legs to heal. What lifts Beginner's Guide To A Head-On Collision beyond mere reportage is the detail, both emotional and physical, that Matthews is willing to share and shape into a meaningful message. This book starts with the chronicling of a disaster and the many pains and distractions it causes. But by the time you get to the end of Matthews road trip the focus has completely changed. there will come a time when you want to slow it back down. It won't do that, either. bubble of pain management. Keep your finger on eject. Mistakes will be made. was waiting out in the open. You nearly drove past, but its ghost swerved at you. into their full, clear, un-ironic truth. Matthews takes us from point and time of impact and then through a couple of years of rehabilitation and up to the present. It is an emotional and physical struggle. In one instant your life and your family's life becomes "the accident." The world is measured in "before" and "since." Most of us have endured some calamity whether it be a death or an illness or an accident and Matthews tells us his survival story in a way we can all relate to, he shares the unsaid. Beginner's Guide To A Head-On Collision is not full of chuckles but Sebastian Matthews does have a sense of humour. More importantly he has found hope through perseverance. None of the "since" is easy but Matthews affirms that is a little easier every day. We learn to cope with change or it will destroy us. The pins in your hip the size of roofing nails. under the strain. Then your ankle snapped. in a while. Let's take it one step at a time. Our morning read was a little later than usual today. Ottawa has just enjoyed our first real snow of the winter and there was much shovelling to be done this morning. Our newest staff member, Philip, showed up, did exactly what we asked him to do and left a little richer. Philip is the highest paid member of our staff and only comes by when he wants to. But we wouldn't be here this morning without him. The rest of us carped our way through Matthews Beginner's Guide To A Head-On Collision as though we were family invested, we ripped through these like the poems were butter and we were hot knives. 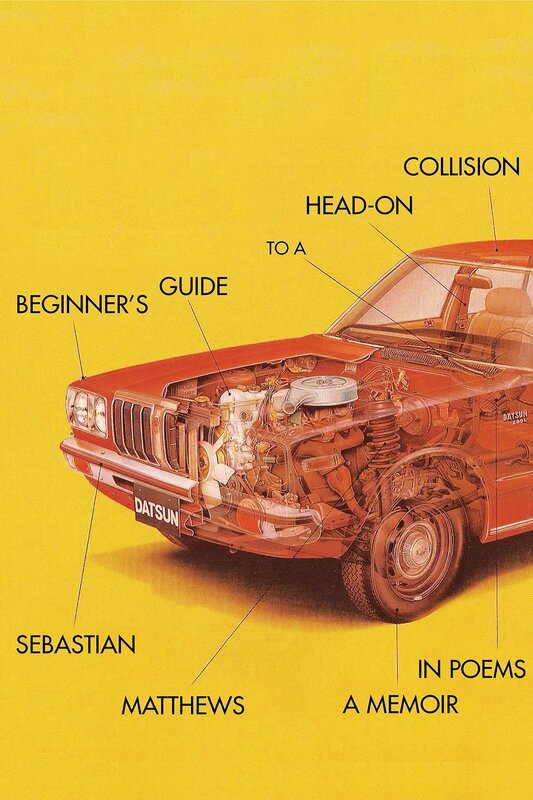 Beginner's Guide To A Head-On Collision is a poetry book with a narrative arc, one poems builds prior knowledge for the next. This is a healing story more that a crashing story and it hooks the reader by the poetry throat early on and doesn't let go until Matthews reveals that hope is what saves us. Sebastian Matthews Beginner's Guide To A Head-On Collision is further evidence that Red Hen Press continues to attract the best poets around. Today's book of poetry sees the world in much the same way as Matthews, hands up on defense, perseverance, hard work and hope. Sebastian Matthews is the author of a memoir and three books of poetry. His work has appeared in American Poetry Review, Atlantic Monthly, Georgia Review, The Sun, and Virginia Quarterly Review, among others. He is currently working on a novel, a collection of personal essays, and a book of prose poems. Matthews serves on the Vermont Studio Center trustee board and on the advisory board of Callaloo: A Journal of African Diaspora Arts & Letters. "Beginner's Guide to a Head-On Collision offers the deeply moving poetic memoir of Sebastian Matthews's life in the years after the car accident that devastated him and his wife and son. The poems, which often read like electric improvised prayer-songs, intimately evoke the terrors and wonders of catastrophic physical injury and of 'life re-booted.' They are disturbing, eerie poems that embody the paradoxes of being The Dead Man at the crossing. They are amazingly honest in their hopeful, mystical sense of fate. In this unforgettable book, the reader is present at the scene of the accident where the hovering spirit that has departed the body addresses the living person re-entering his brokenness and answering for his transcendent awareness." "It cleaves the life. An auto accident. Moving it into before and after. Parts of this postcataclysm instruction manual read like a dream, as if what is happening is happening both to the self in toto--batted, fractured, spliced and reconstructed--as well as to another self that watches, cool and objective, determining the outcome. By reading Beginner's Guide to a Head-On Collision we learn how to go in and out of the body as necessary and, in order to take in the possibility of a larger life, how to wrest from breakage release from our thin views of who we are. Here is Matthews the husband, the father, the driver, the patient, the Virgo obsessively advising, the man looking back, the man looking forward." "Sebastian Matthews has incredible patience for the beginner, since he is one himself, as he confronts the severe agony of a terrible car accident. In short narratives, brief lyrics, prose poems, and mock astro-missives, Matthews reminds us how the brutal pain of collision might dramatically change us. '[W]hat we shared was the truth of impact / our bodies ringing like bells in a small town / on a Holy day . . .' These poems detail both physical and spiritual misery, and though suffering can turn us into many things, Matthewsour banged up storyteller, singer, docentstrives to deliver himself back to a body of affection, intimacy, and kindness. Beginner's Guide to a Head-On Collision is a remarkable record of that difficult journey."